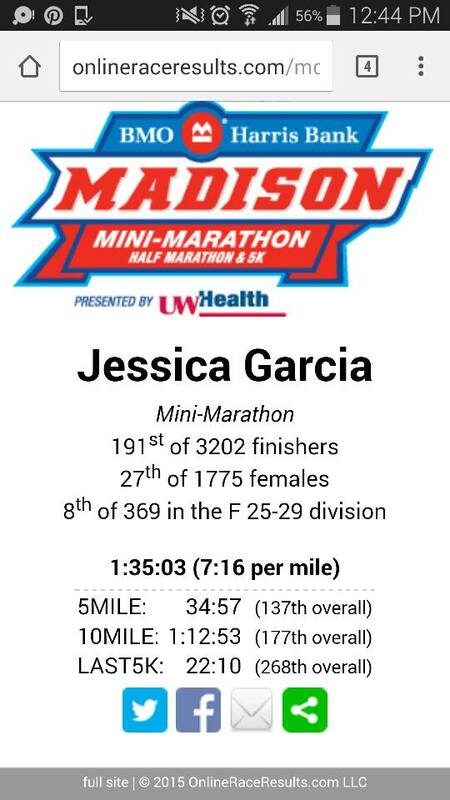 The Madison Mini Marathon in Madison Wisconsin FINALLY fit into my racing schedule! Madison has always had a special place in my heart. Since my teenage years I’ve wanted to run away to Madison but timing never seemed to work out well, so I never did. My initial escape plan was back in 2005 but I wasn’t able to move after I got pregnant with Hails. My second attempt was back in 2011 when Woodman’s was opening a new store. That time, Love kept me here, along with an attempt at a second degree and possible career change. All of that fell through in the end. To me, Madison has always represented a freedom of sorts that I’d always been chasing. 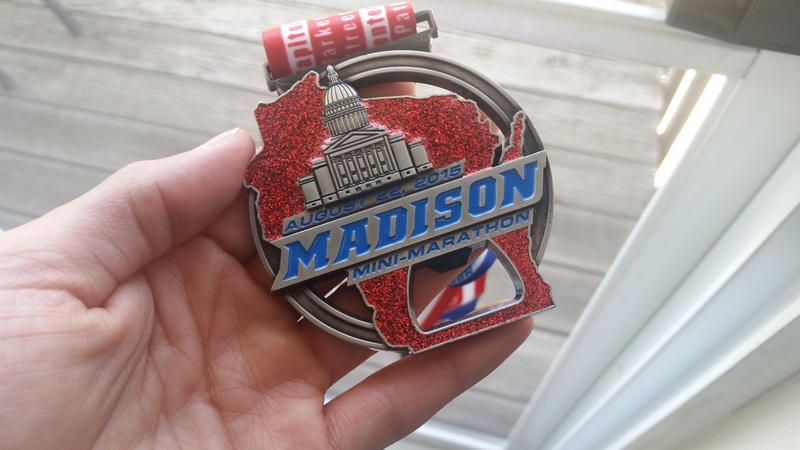 Anyway, back to the race… The Mini is described as a scenic course that includes many Madison landmarks including Capital Square, Dance County’s Farmer’s Market, State Street, Camp Randall Stadium, Kohl Center, the Arboretum, Picnic Point and the University of Wisconsin Campus. To be honest, I only remember a few of these landmarks! Andrew and I were on the road from Janesville around 5:30 A.M. The drive seemed to fly by! Traffic got a little crazy once we got closer to the start line but we were able to easily and quickly find parking in a parking garage. There was a moment that we both got nervous and Andrew offered to let me start walking to the start line while he parked, but there was NO way that was happening. Realistically, we had plenty of time. Even though I have wanted to be in Madison for so long I still have no idea where anything is. I could easily get lost without my GPS. I followed Andrew and the crowd and we finally found our way to the starting corrals. I was pretty shocked to see my bib said Corral A. I sent an email to get seeded to the front so that I could start with people who were running my pace, but honestly I had no idea that I’d be that close to the front. It was pretty intimidating seeing the starting line right there. I found Jason, who was pacing the 1:30 group. We had been chatting about the race throughout the week and I told him I thought I could stay with him. I knew this was a hefty time goal but I had to try. 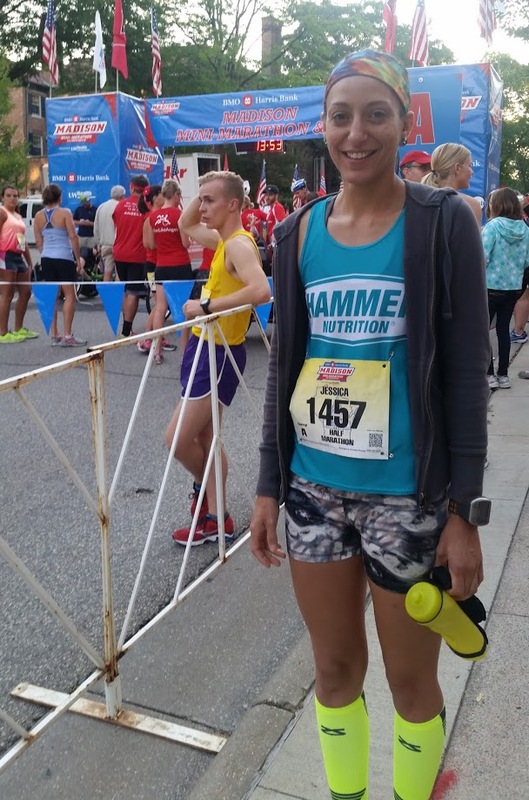 My last half marathon was the Rock ‘n Sole run in Milwaukee in 2013. I finished that race in 1:42:24 at a 7:51 pace, so IF I could stick with the 1:30 group that would be a HUGE PR. Weird thing is, even though I had this hefty time goal, I never got nervous or felt anxious. I knew that I was going to get out there and do my best no matter what. Jason and I didn’t get much of a chance to talk before the race, there was a big group that was going to try to stick together. I chatted with a few friends from Janesville before the start. It was nice to see them, especially since we haven’t run into each other in a while. The race seemed to suddenly start. 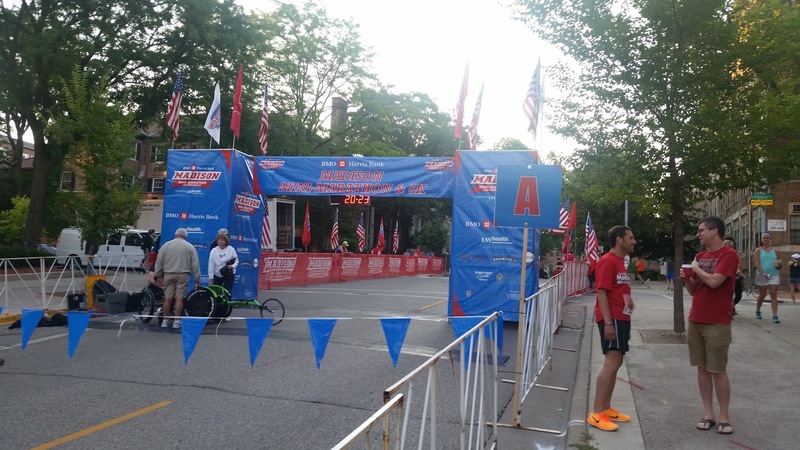 The first part of the race ran toward the capital for a short time before heading down to state street. This stretch was busy! Everyone was pretty clumped together and I even caught a few elbows here. I was in a cluster with mostly guys which is pretty normal. I heard Jason yelling encouragements to his team of runners. I was able to stick with the 1:30 group for a good 4 miles. When I’m working hard I usually let out a loud “Woooooop!” every once in a while. At one point I did that and Jason shouted back “You got this Jessica! Keep it up!” He was a bit ahead of me but knew it was me. It was good to have that encouragement from him, as hard as I tried, I fell off the 1:30 group by mile 5 and struggled to hold onto 7:30 pace. The portion that ran through the Arboretum was beautiful but one of the hardest parts for me. I struggled up a slow steady climb. There were moments I asked myself why I was pushing so hard. What did I have to prove anyway? That’s just my mind playing games. I even thought that I hated shorter distances because I had to run so fast! Honestly, most of this race was a blur. Maybe I wasn’t in the moment or maybe I was too focused on my time? Who knows. I feel like I did a lot of zombie running. I can just imagine how I looked to people working the aid stations. One aid station was great. There were young girls on both sides calling out names of passing runners. The line of girls seemed to go on forever. They shouted my name and encouraged me to keep going. It was very uplifting and even though I felt like a zombie it helped. I needed all the energy I could get and somehow this aid station seemed to help. 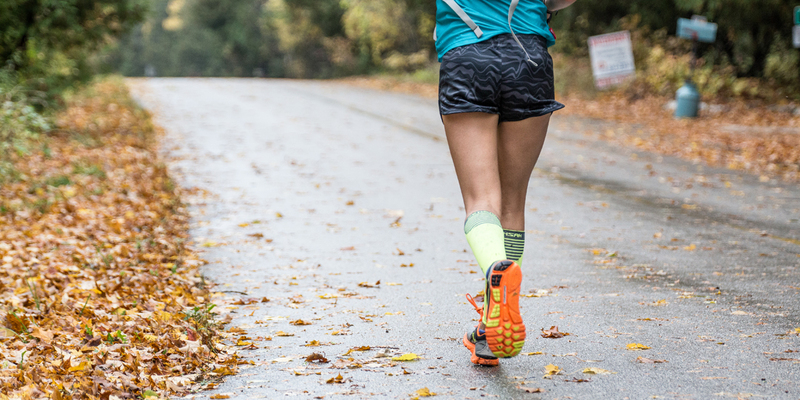 The final miles felt like a scramble through the city with lots of turns and short but big hills here and there. Finally, I knew I was getting close when I saw spectators line both sides of the street. The final stretch was a nice downhill. As I ran in, the crowd was super quiet! WTF!? So I threw my arms up to get people to cheer for me and they did! I think my favorite part of this race was the finish line. It was electrifying. There was a man announcing names as we cross the finish line along with a couple Bucky’s dressed up acting silly. In fact, one Bucky was doing a headstand on the finish line as I crossed. There was also a pedestrian bridge just before the finish line that was completely lined with people, which was an amazing sight for probably both runners and spectators! The moments after I crossed the finish line were beyond weird and unlike any experience I’ve ever had at a race. Even though there were spectators everywhere the only thing I could hear was my own breath. I felt like I had some sort of weird tunnel vision happening. I slowly walked toward volunteers giving out finishers’ medals. One was hung around my neck as I continued to zombie walk toward other tables. I was given water and popcorn as I saw Andrew heading my way to the end of the finishers shoot. I still couldn’t hear anything but my own breath as I stumbled on. Finally, I reached the end and chatted with Andrew. 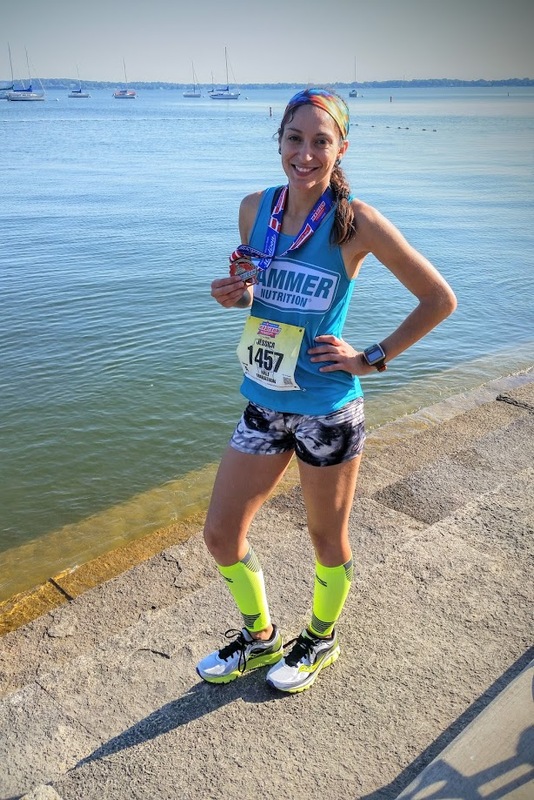 I got a quick pic in the finishing shoot and we chatted with other finishers for a short time before heading to relax on the Terrace with a morning beer! That beer was the best tasting beer I’d ever had! So, I finished with a time of 1:35:03. 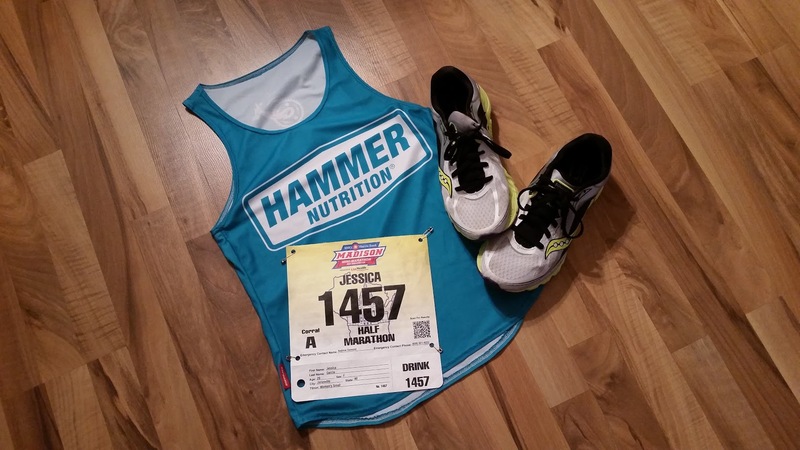 I didn’t get my 1:30:00 half marathon, but I’m super happy and stoked about my time. I finished with a 7 minute PR which makes me pretty happy! Effort wise, I couldn’t have pushed any harder, even if I wanted to. My HR reached 190, which is probably a new maximum heart rate for me! My average heart rate for this race was 179… eeeks!